Shirts With Random Triangles: Two 2017 Prospects Decommit From Texas A&M. Martell was the first to decommit, announcing his decision on Twitter. It's a major blow for a program which saw QBs Kyle Allen and Kyler Murray transfer to other schools following the 2015 college football season. 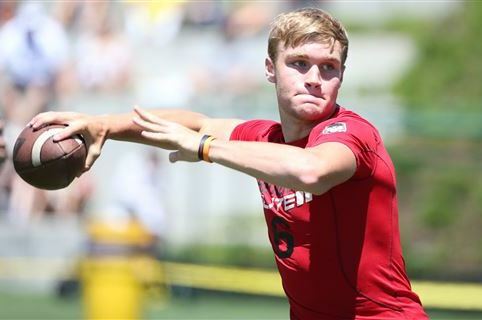 247Sports grades Martell as a composite five-star dual threat quarterback prospect. The recruiting site ranks Martell as the no. 1 dual threat QB prospect, the no. 1 prospect from the state of Nevada, and at no. 33 among 2017 prospects nationally. Mannie Netherly was the next to commit. His decision was in response to Texas A&M wide receiver's coach Aaron Morehead, whom reeled off a series of now-deleted tweets apparently chastising Martel's decision without mentioning the QB by name (which would be an NCAA violation). 247Sports grades Netherly as a composite four-star wide receiver prospect. The recruiting site ranks Nehrerly at no. 27 among WR prospects for 2017, at no 34 among 2017 prospects from the state of Texas, and at no. 209 among 2017 prospects nationally.